VISET and Citizens Manifesto representatives addressing journalists during a press conference at Media Centre. Vendors in Harare have vowed not to vacate the streets of Harare and condemned the actions of Minister July Moyo who gave them an ultimatum to vacate the streets within 48 hours. 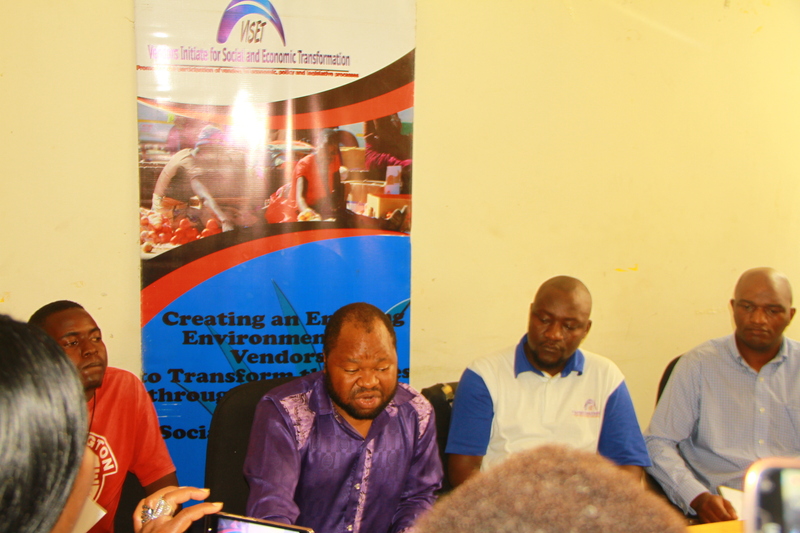 This came out at a press conference held in Harare today where the Vendors Initiative for Social and Economic Transformation (VISET) executive director, Samuel Wadzai and civic society group Citizens Manifesto castigated the initiative saying that the ultimatum was unconstitutional. “Such a move is irrational, inhumane and barbaric apart from the fact that it runs contrary to the constitutional objective which obliges the state and all its agencies to promote private initiatives of self-reliance.” said Wadzai. Vendors have also made it clear that they will be forced to retaliate if the government continues to force them off the streets without an alternative. “Ultimatums and threats of force will only worsen the already precarious situation. We will not go anywhere,” added Wadzai. The vendors also decried gross human rights violations in the form of sexual exploitation and arbitrary arrests. “In Harare alone, more than 5828 of our members reported various forms of human rights abuses. Throughout the country, arrests, imprisonment, and prosecution of thousands of street vendors also characterised the year. Some of our female colleagues reported sexual harassment and abuse wherein they had to provide sexual favours in return for their confiscated goods.” reads the statement. The vendor’s response to government comes three days after Minister July Moyo issued a 48 hour ultimatum for vendors to vacate the streets of major towns and cities in the Southern African nation. Over the past few years, soaring unemployment levels and economic underperformance have prompted many Zimbabweans to turn to the streets to sell their wares in order to earn a living. This has resulted in conflicts with local authorities, who in 2015 escalated street cleaning exercises into cat and mouse turf wars with street vendors which most local authorities led by Harare City defended as restoring sanity, but these exercises were met with widespread condemnation and resistance from civic organisations.